(Gloucester Township, NJ) – The recent deaths of CNN personality, Anthony Bourdain, and designer Kate Spade, remind us that the factors which can lead an individual to end his/her own life have no boundaries. The Freeholder Board wants to remind residents that if you are ever contemplating suicide, there is always help available. Families of those suffering from mental illness, or individuals who wish to seek help themselves, have several ways to find help nearby. Oaks Integrated Care provides a first line of defense through its provision of Crisis and Early Intervention Support Services, and can be reached by calling (856) 254-3800. 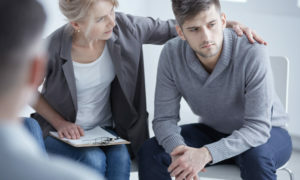 Both they and South Jersey Behavioral Health Services also provide psychiatric services on a walk-in basis. South Jersey Behavioral Health Services can be reached by calling (800) 220-8081. The Mental Health Association of Southwestern NJ provides peer supports, family supports and Mental Health First Aid training. Their telephone number is (856) 566-0639. The county Department of Health & Human Services offers resources and information for anyone in need and can be reached at (856) 374-6361. Every hospital in Camden County also provides an inpatient psychiatric unit for more severe cases of mental illness.